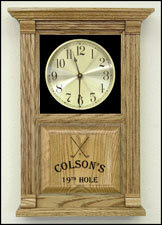 Our golfing themed clocks and products will make a great addition to your golfing decor. 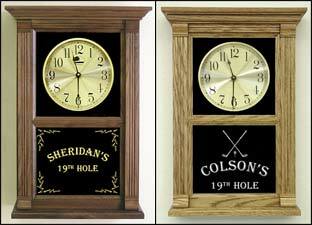 Etched golfer clocks or a personalized golfing mirror or bench makes a great gift for your favorite golfer. 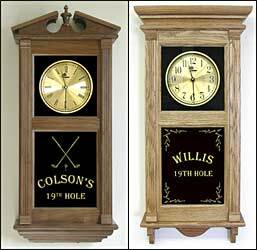 These personalized golf clocks are solid wood and can be ordered in oak, walnut, or cherry. 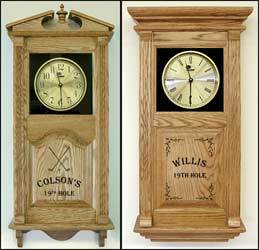 We also have other golfing themed gifts such as benches and mirrors to complement the custom golfer clocks. 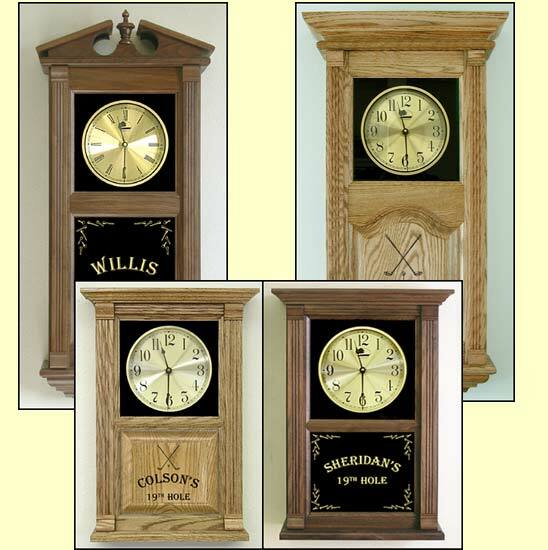 The clocks come in different sizes and can have an etched wood or glass panel personalized with your name. Choose wood type, stain color, and face. The wall clocks have two styles of tops and bottoms to choose from. The small wall clock can stand or be hung on the wall. An etched golf themed clock makes unique gifts for golfers You will choose the wood type, etching design, and other options on the order form. Clocks with other etched images, including wildlife, hunting and fishing images, florals, and other scenery are also available. Choose From A Variety of Options on the order form. Shown in walnut wood on left and oak on right. A Custom Etched Golf Bench is a great addition to your golfing decor. Our handcrafted solid wood benches are available in oak, walnut, and an oak-walnut combination. Other woods such as cherry can be special ordered. Click here to see a detail of the personalized golf etching. 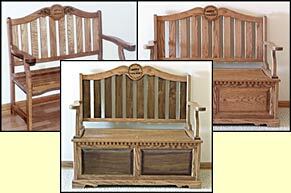 For pricing and complete information on our solid wood benches. Personalized golfing mirrors with solid wood frames come in many different styles and can be ordered in oak, walnut, or cherry with your choice of stain. See the different styles on our main mirror page. Choose the etching design on the order form.